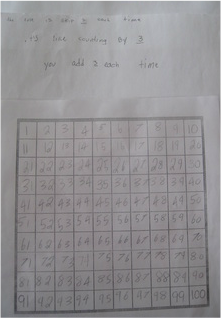 This lesson was used during the first week of our algebra and patterning unit. We started with introducing the unit using 100's charts. Our first lesson we simply asked students to look for patterns in the chart. 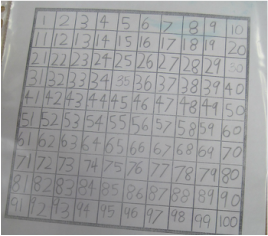 After taking up group ideas, we noticed that our students were very skilled at seeing patterns that traveled vertically down the chart (i.e., 5's column all end in 5's), and they could skip count but did not seem to understand why this occurred/how we could develop a rule for it. 3. Have them skip count (beginning at 0) with that number. For each count they need to circle the corresponding number on their chart. 4. Think-pair-share: Can you see a pattern? What is it? How can we describe it? 1. With their partner, have the students pick another number to count by. (maybe expand 0-15). 2. 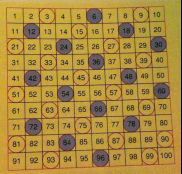 Have them fill in their hundreds chart (circle the numbers) and answer these questions (see right). 3. Collect their answers separate from their charts. 4. Have them switch their hundreds charts with another pair. 2. Think-pair-share: Can you see a pattern? What is it? How can we describe it? Can we make connections between different patterns? Diagnostic: Can students use math language (i.e., skip count, counting by etc.) to justify their answers? Formative: Can they identify patterns in multiple ways (be able to create one, and identify a pattern in another students work)? Can they make connections with/between multiple patterns? Summative: Students will submit work with partner for assessment (both their hundreds chart and their responses to Rule Makers).